Skor-Mor Corp.; 13Sep71; KK223560. 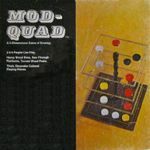 Mod- quad, a 3-dimensional game of strategy. Folder. © Skor-Mor Corp.: 13Sep71; KK223559.